Historical Marker #1601 in Kenton County commemorates the Roebling Suspension Bridge, the first bridge to span the Ohio River. Opened to traffic on January 1, 1867, the bridge was the longest suspension bridge in the world at the time. The cost of the completed project totaled nearly $1.8 million. In August 1855, the Covington and Cincinnati Bridge Company board of directors chose German émigré John August Roebling to be the architect of the bridge. Construction began in September 1856, but encountered several delays on the road to completion, including financial problems in the nationwide economic panic of 1857 and the outbreak of the Civil War. While the bridge was formally opened on January 1, 1867, it was later in the year when the Covington Street Railway Company laid rails for its horse-drawn cars across the bridge. By 1895, nearly 1.4 million people crossed the bridge annually, and almost six-hundred streetcars crossed daily. In 1895-1896, the bridge was restructured to accommodate an increase in traffic, and added two new steel cables, doubling the original strength of the bridge. 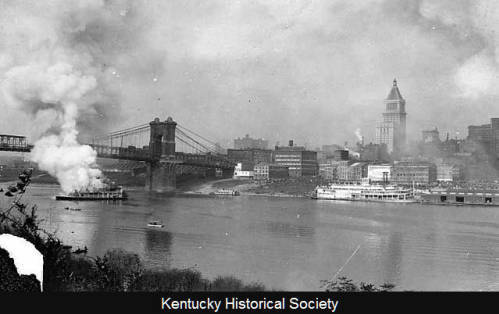 Other improvements included a new Cincinnati approach to the bridge well above the normal floodplain, which allowed the bridge to remain open in the devastating 1937 Ohio River flood. The bridge company sold the structure to the Commonwealth of Kentucky in 1953. In 1975, it was listed on the National Register of Historic Places and became a National Historic Landmark. 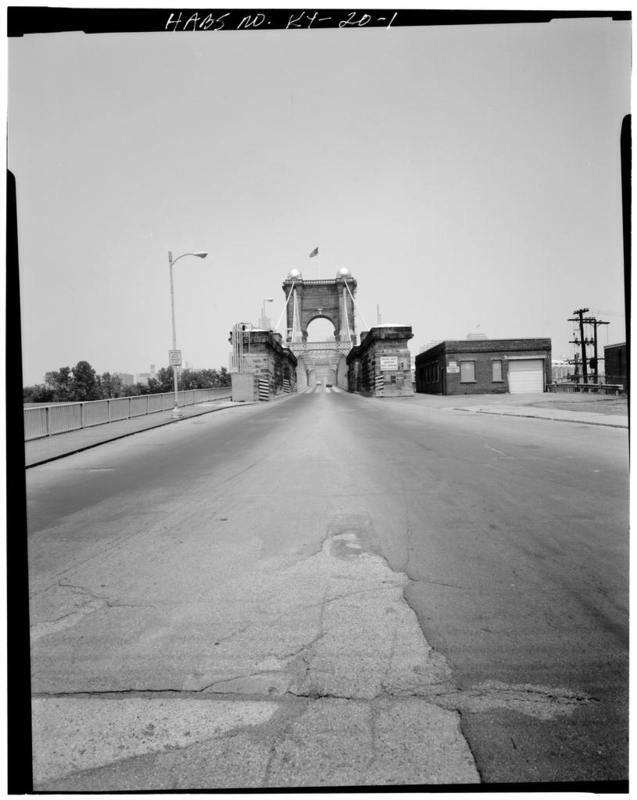 The American Society of Civil Engineers honored the bridge as a national historic civil engineering landmark in 1983. 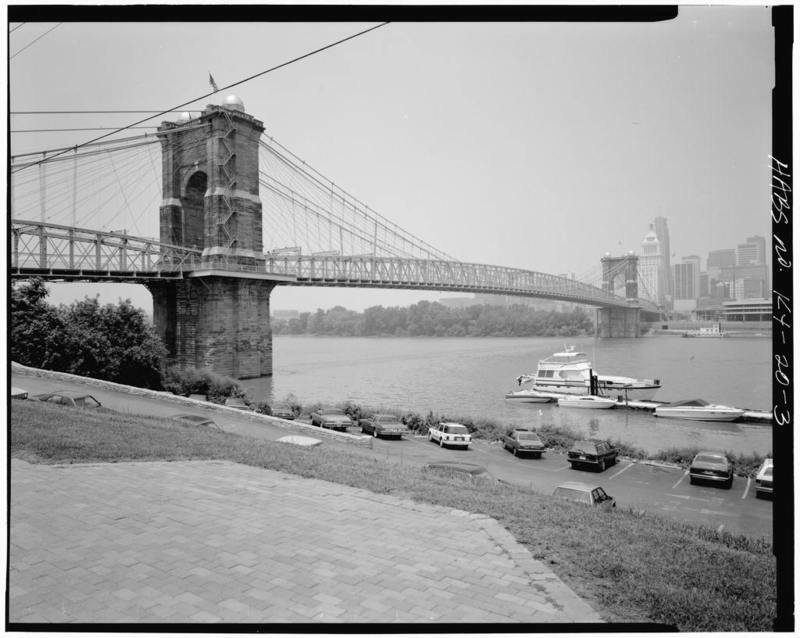 Also in 1983, the span was renamed the John A. Roebling Bridge in honor of its engineer, who also designed the famed Brooklyn Bridge in New York City. Roebling Bridge: Opened in 1867, the bridge connecting Covington, Kentucky with Cincinnati, Ohio was designed by, and named for, famed architect John August Roebling. Courtesy of the Library of Congress. 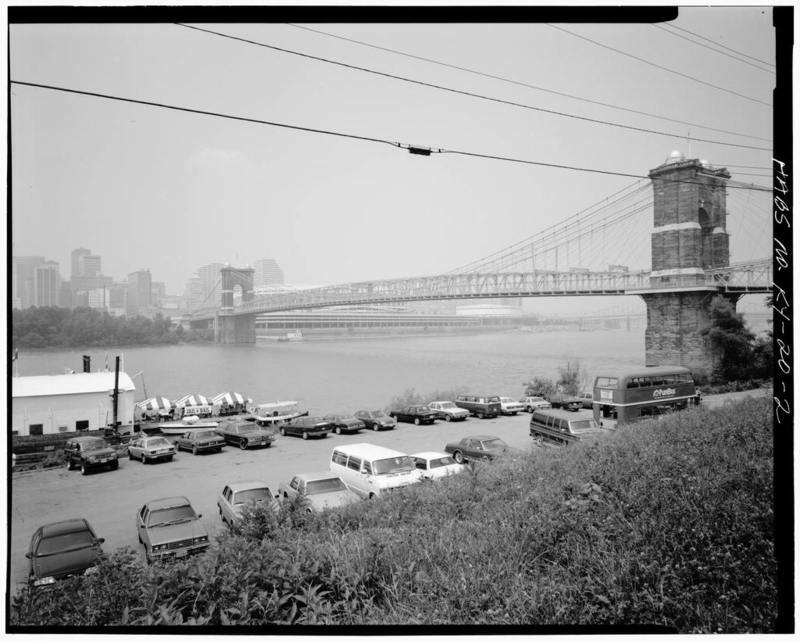 Roebling Bridge: At the time of its completion, the Roebling Bridge was the longest suspension bridge in the world. Courtesy of the Library of Congress. Roebling Bridge: The Roebling Suspension Bridge has received many honors, including its place on the National Register of Historic Places list in 1975, and being named a national historic civil engineering landmark in 1983. Courtesy of the Library of Congress. Roebling Bridge: The Roebling Bridge allowed the normal flow of Ohio River traffic room to pass underneath unless at high flood stage. Courtesy of the Kentucky Historical Society. Roebling Bridge: The Roebling Bridge is visible in the background of this photograph of a steamboat fire. Courtesy of the Kentucky Historical Society. 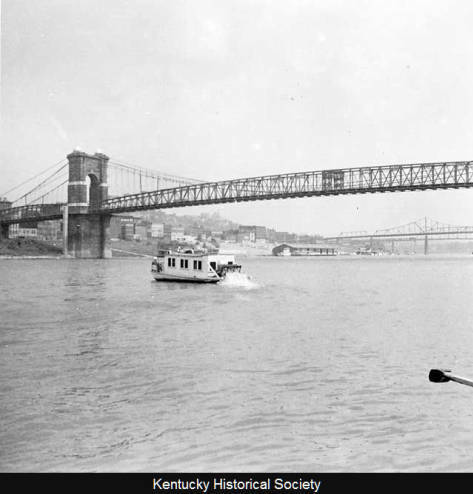 McKenzie Martin, “Roebling Suspension Bridge,” ExploreKYHistory, accessed April 22, 2019, https://explorekyhistory.ky.gov/items/show/586.